For your home or business to remain safe, it is important to maintain proper care of all fire extinguishers. In order to ensure that they are available and operate properly when needed, both federal certification requirements and state licensure requirements mandate that all businesses properly inspect, test and maintain their portable fire extinguishers. When an extinguisher is recharged there should be a tag attached given the date of the recharge, the name of the person or name of the company that has performed the recharge. There should also be a “Verification of service” collar around the neck of the extinguisher and must include the month and year the service was performed. Store Pressure ABC extinguishers require internal maintenance every 6 years and hydrostatic testing every 12 years. Fires that are in ordinary combustibles such as wood, paper, cloth, trash, and plastics. Fires that are in flammable liquids such as gasoline, petroleum oil and paint. They are also in flammable gases such as propane and butane. Fires that involve energized electrical equipment such as motors, transformers, and appliances. Fires that are in combustible metals such as potassium, sodium, aluminum, and magnesium. Fires that are in cooking oils and greases such as animals fats and vegetable fats. Knowing what extinguisher to use for what fire is extremely important. Not understanding the proper extinguisher could cause the fire to re-ignite. P-ULL THE PIN. 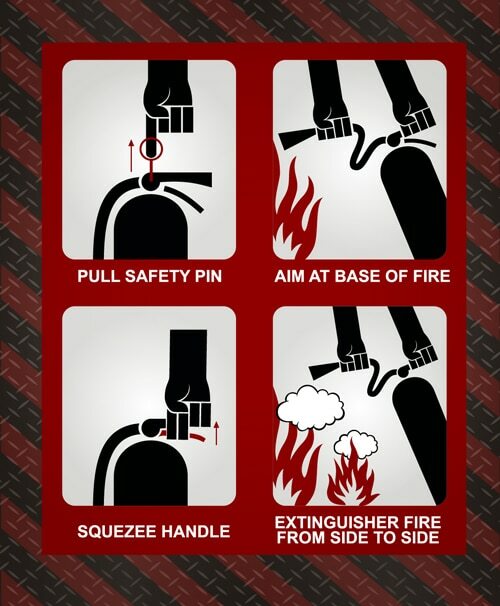 HOLD THE EXTINGUISHER WITH THE NOZZLE POINTING AWAY FROM YOU AND RELEASE THE LOCKING MECHANISM. A-AIM LOW. POINT THE EXTINGUISHER AT THE BASE OF THE FIRE.